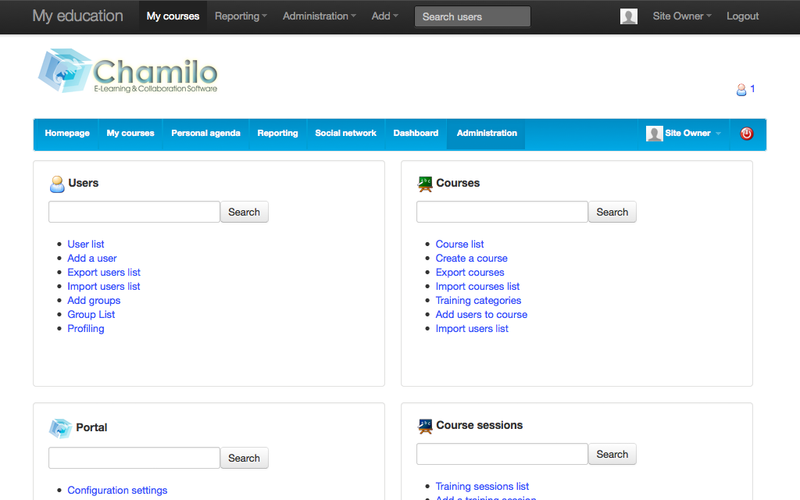 Chamilo est une application open source de gestions de cours. Dérivé de Dokeos en 2010, Chamilo est actuellement utilisé par plus de 3,5 millions d'étudiants et d'enseignants à travers le monde. Chamilo 1.11.8 is a minor, bug fix and security fix release with dozens of improvements and bug fixes. Update PHP files extension matching pattern in .htaccess and documentation to match all possible forms supported by PHP 5 and PHP 7.
add rules to .htaccess to prevent direct PHP execution from the corresponding directories and updates security.html with a missing change in the previous commit. Using security.html is still the recommended way to go for security, but in the absence of that, we want to make sure Chamilo is always more secure. Check access to "who is online in session"
Chamilo 1.11.6 is a minor, bugfix release on top of 1.11.4 with dozens of improvements and bug fixes. 26 Juillet 2017 - 1100MBChamilo 1.11.4 is a minor, bugfix release of the 1.11.x branch, with a large number of bugfixes on top of 1.11.2. Dropped support for PHP 5.4 and inferior (now REQUIRES PHP 5.5 or more). The Chamilo software is comprised of nearly 114,000 files and directories. IF YOUR WEBHOSTING PROVIDER LIMITS THE FILE TOTAL FOR YOUR ACCOUNT, DO NOT ATTEMPT TO UPGRADE THE APPLICATION USING Applications UNLESS YOUR ACCOUNT IS CURRENTLY AT LEAST 114,000 FILES BELOW THE ALLOWED QUOTA. In this case you should upgrade the software manually. (9111c61c) Fix group by . (93cae24e) Format code, use Session class, use Display::addFlash function. (ab96a562 - #8108) Fix Button "Deny invitation" does not work. (a377c0fd) Fix usergroup_rel_user during migration. (ba346708) Fix session_rel_user table if session does not exists. (72d8aae5) Remove lastLogin use last_login instead. (6e09ed4e - #8053) Fix Bug - You can not edit attendance list. (5aa7996a) Fixed bug on edit user webservice: extra fields were not updated because $extras array were not transformed to associative array before sending it to editUserHelper. (ec5fd4a6) Fixed bug on create user webservice: extra fields method didn't return result so just the first one extra field was processed. (78a82f96) Added initialization of $op_Params to avoid warning on xml returned in webservice to disable a user. (d9b4c01a) Avoid notice message for reverse proxies with only 1 IP. (9309b7e0) Fix course creation SQL error due to wrong default values. (ede6cf87) Set updated_at by default in model class if is present in columns. (8baa4bb9) Fix error creating hotspot question when relpath != "/"
(d8531027) Remove files that are not needed. 23 Décembre 2015 - 700MBThis release is a minor, bugfix release. Migrations from 1.9.x is now possible without major issue (that we know of). (c8bc145b) Delete courses folder after migration if folder is empty. (74ca0d17) Remove $_configuration calls and use functions, format code. (c3be69c9) Fix session edition + fix session access error. (e88e29cc - #7971) Allow create folder and rename folder/file in "my files"
Many icons have been re-designed in SVG format. Use the Test server mode to test showing all available SVG icons instead of PNG. 26 Octobre 2015 - 700MBChamilo 1.10.0 is a major version of the 1.10.x branch, with new features and bugfixes on top of 1.9.10. Chamilo 1.10.0 integrates several new techniques of development that should improve is reliability, speed and flexibility. There were no specific security flaws detected during the development of 1.10.0 but standard development procedures and criterias were followed during the development to ensure a very high security level. A few languages now get a "parent" language which is not English. In this case, we have based the update query on an ID that we "assume" to be the right one for Spanish, Italian, French, Chinese and Portuguese. If the ID is not correct, you might, in the worst case scenario, get Chinese or Arabic terms appear in a language that is not the primary one, like Galician (normally taking Spanish as parent language). This can be fixed very easily by an "UPDATE language SET parent_id = NULL"; for all your languages, and then re-apply the parent manually to your sub-language if it needs one. "Character set" platform setting can't be modified. It is now fixed to UTF-8 (see #7652). This comes as a decision given the fact that other character encoding types were only there for backwards compatibility reasons, and that the last version with something else than UTF-8 was released more than 5 years ago. 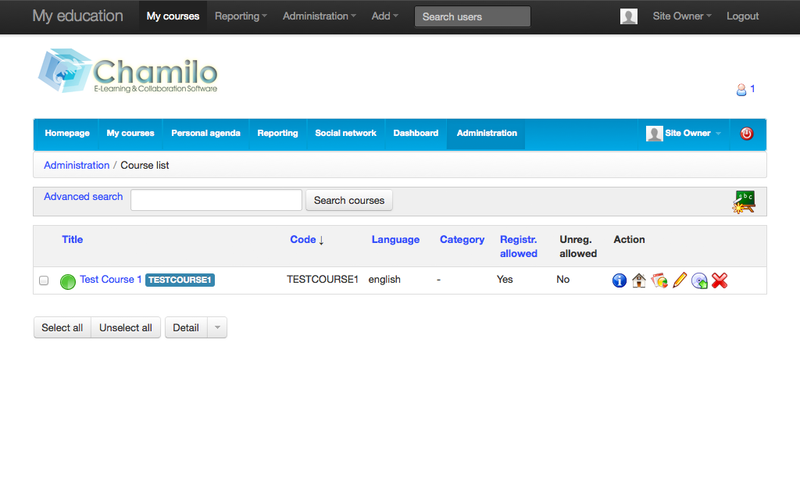 Starting from 1.10.0, courses directories will really be deleted when the course is deleted. No more logical-delete-but-no-physical-delete policy where the folder used to remain available for last-minute recovery of resources. You are trusted to take backups when necessary to avoid inconvenient situations. This comes as a decision considering the increasing number of huge installations where ghost course directories become a considerable space issue very quickly, and as an observation that, in fact, this feature is very little known and very few people use it to actually recover deleted course material. (d30825c1) Add feature to restrict some global tabs to admin/teacher only. (545ca410 - BT#4301) Unify classes and social groups. A "closed-doors" social group is a class and can be subscribed to courses. 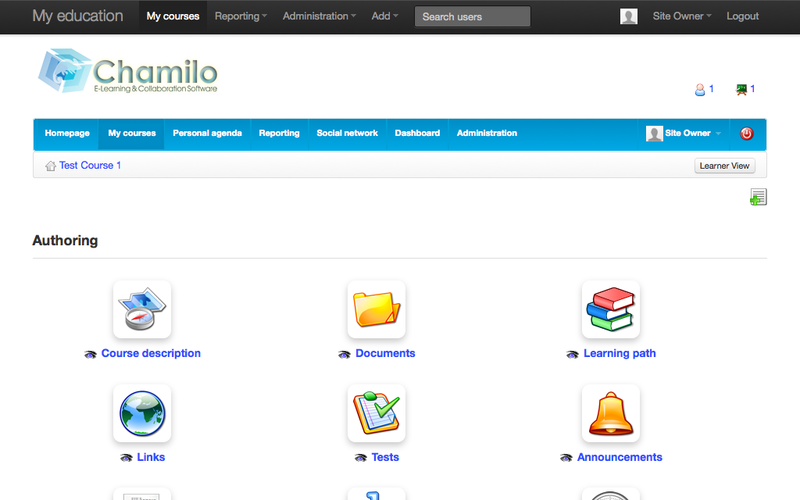 Classes now have their own social space to interact out of courses context. (4ff6568d - BT#7058) Add unoconv support to enable broader file formats exports and conversions (more in future versions). This requires the installation of the UNO libraries on the server, so might not be available to all admins. (55e678c8) Copy conf files during migration. (c1dd1e0a) Save datetime values in UTC in the database when using Doctrine. (356cc8b1) Change size of fields + fixing migration files. (1bf20ea5) Update group.id with group.iid. (6f7a4e3a) Add sortable listeners (for plugins). (5aee71c6) Add migrations.yml in order to call correctly migrations command lines. (8682e0db) Add CourseManager and CourseRepository classes. (b46fa741) Add security + extra fields abstract classes. (6c57ec9c) Add ExtraField entities in order to unify fields. (3d24dc0a) Adding doctrine cli, to generate migrations, create/update schema. (41952c22) Remove all index.php files inside the old courses directory. (101ad73e) Put .htaccess in the root. Don't add index.php inside courses. (41b5ec4c) Remove unused table php_session. (10143792) Remove ie6 fixes (IE6 not supported anymore). (2738abd5) Rename survey_manager to SurveyManager + fix queries. (929e262c) Replacing OR with || in learning path quiz items + update id based in iid. (9d54652c) Remove use of 0000-00-00 00:00:00. Replace by null. (a4acc4b4) Add iid in c_* tables. (6782df1b) Add version 1.10 migration. (a2f08ce5) Use doctrine entities to create Database. (545330d9) Add session_id in gradebook. (a91a2fa3) Using Doctrine as a DB layer. (a40a7f69) Using Doctrine to connect to DB. (5fa16756) Use Doctrine to query the DB. (fc6cbb5f - #7517) Adding mathjax plugin + db change "enabled_mathjax"
(af6776d7) Consolidate database creation in one file. (d3bcd994) Remove "virtual course" unused function + format code. (cfb1353e) Adding form layout constants, horizontal or inline. (98f4510a) Remove virtual course code. (5451fd53) Delete group category and group when deleting a course. (0672f038) Fix course category order. (a9aec199) Fix iid/id issues when using exporting/importing courses. (8b3b3745) Remove unused build_datetime_from_array, fix dates. (3ea9c064 - BT#10139) If course plugin image does not exists then use default image. (412f9460) Only show forum group information, the rest depends in the course. (90edfa15) Fix bug when teacher can't edit document if it exists in a session. (de069364) Certificate into landscape position. (2e8fb1ab - #7717) Add "direct message" type instead of sending "You have a message from X"
Feature #7275: Add "Sessions catalog"
Feature #7348: Estilo para Documento Upload igual que carga de foro. Feature #7471: Rename "custompages" folder to "custompages-dist"
Bug #6044: AICC import - "The package you are trying to upload has an unknown format." 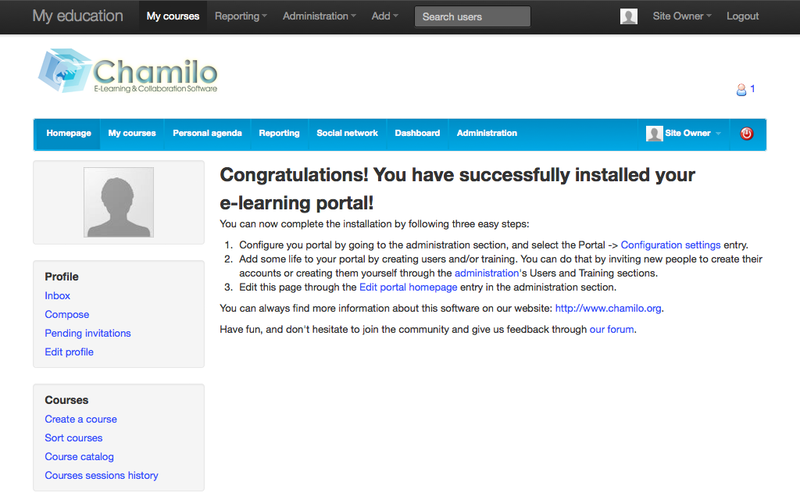 Bug #6346: Admin can't access to the portal due the legal conditions. Bug #6691: Audio - After selecting an audio file the platform states "no audio file selected"
Bug #6773: Long-standing sub-language bug: terms saving sometimes misses "
Bug #6802: Ejercicios: No carga el valor verdadero en el formulario de modificar pregunta. Bug #6811: Problema de Puntuacion en la herramienta Ejercicios Pregunta tipo "Respuestas Multiples v/f/no se"
Bug #6824: When deleting a user the "survey.author" field is not removed/updated. Bug #6932: Button to delete a folder in Assignments does not work. Bug #6968: Allow admin account to unsubscribe from a course. 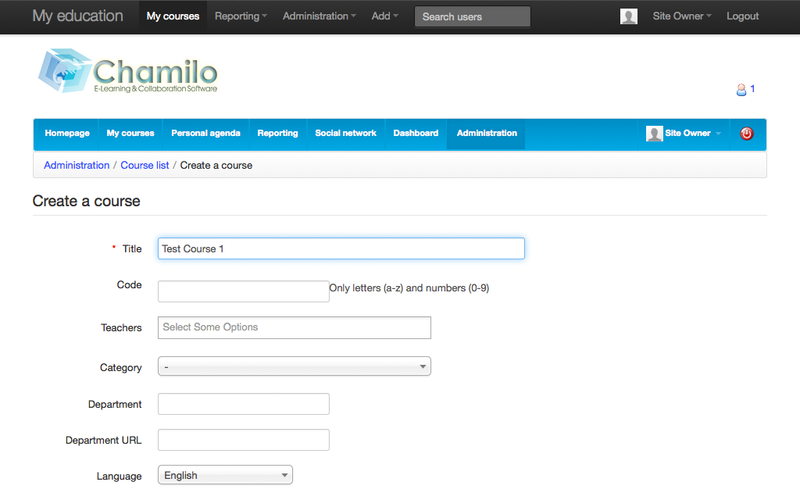 Bug #6977: Multiple URL slave admins can delete global courses completely, oh no! Bug #6981: jquery.lp_minipanel.js code error. Bug #6988: Script occupé ou ne répond plus. Bug #6990: main/mySpace/index.php page takes a lot of time when a Human Resources user has a lot of sessions/courses. Bug #7071: Replying a message in social network. Bug #7103: Etiqueta del boton deberia decir "Empezar encuesta" en vez de "Siguiente pregunta"
Bug #7105: Falta icono en botón "Añadir respuesta"
Bug #7113: Remove alternative "Multibyte string" code. Bug #7134: When api_get_setting('include_asciimathml_script') == 'true') the page is broken. Bug #7161: La edición de la programación didáctica no se muestra correctamente. Feature #6165: Add option to prevent "login as"
Feature #6312: Set default session status filter to "All"
Feature #7056: Add tracking when teacher clicks "clean_results"
Support #7165: Persiste el problema de acceso a la plataforma, problemas de cookies? Bug #4374: hyperlink within "Travaux"
Feature #6019: Social messages: add "Mark all as read"